Rob Yarger has always released his boxes by randomly picking names from his subscriber list and offering the lucky winners the chance to buy his latest offering. He has thought for a little while that this may be unfair and so, starting with the last box, he moved to a first come first served method to allow all-comers a chance of buying if you are on his mailing list. The other big advantage of the new system is that he is no longer kept waiting and out of pocket whilst collectors take time to reply to his offer. However, some collectors have thought the new system is just as unfair due to the vagaries of time-zones meaning that boxes are sold out before they wake up in the morning. Unfortunately for Rob, there is no truly fair way of doing this. I personally prefer his original approach - the random drawing allows for true collectors to get a chance without worrying about being asleep. I would prefer that Rob actually control the sale personally so certain people who know him very well and have collected for years do not miss out. I know it is biased that way but Rob should be able to treat his friends special if he chooses. I am not close enough to get special treatment but I think there are some who should get it. The Stickman Hexagram Box was released this new way and went on sale at about 8am UK time a few weeks ago. I had just put in a Spinal anaesthetic and done a Lumbar plexus block (don't follow those links if you are squeamish) on a patient and positioned her for a Total hip replacement when the phone on the work surface vibrated. I looked up to see the notification on my phone and grinned thinking I had got an offer and had plenty of time. The sedation infusion was started and we went from the anaesthetic room into the OR. Having re-established my monitoring and done our WHO checks (it's mandatory!) I had a moment to look at my phone to see what was on offer before writing the notes. Hmm! Looked nice and I clicked to look at the details. OMG! nearly sold out already. Click click clickety click and Phew! I was several hundred $$ lighter. Thank heavens for mobile phones! I duly received a tracking number and happily watched it move across the USA and then over to the UK. Then it just stopped moving - held by customs, released and then held again whilst they thought some more about how much ransom to charge me! After a week of fear, it began its' journey to Sheffield and I held my breath when it's journey to me suddenly changed to address not known! Aaargh! The UK side of the delivery was left to Parcel-farce and despite my having lived here for over 15 years and received deliveries from them throughout that time, they seemed to have forgotten where my house was. The following day after my missed delivery, I phoned the local offices and let them have a piece of my mind. I was informed that the reason for the inability to deliver was that there was no house number on the package and they didn't know which house it should go to. I informed them of the number and they assured me it would arrive the following day....It did not arrive despite me waiting in for it. Very odd! Even more odd when the tracking said that they had tried to deliver it and there was no one in. The instructions were to go to the local post office to pick it up (and pay a fee too). Sigh! At 5pm I finally held a box that most certainly DID have the house number on it in 2 places! I hope that your deliveries are less fraught than mine are. 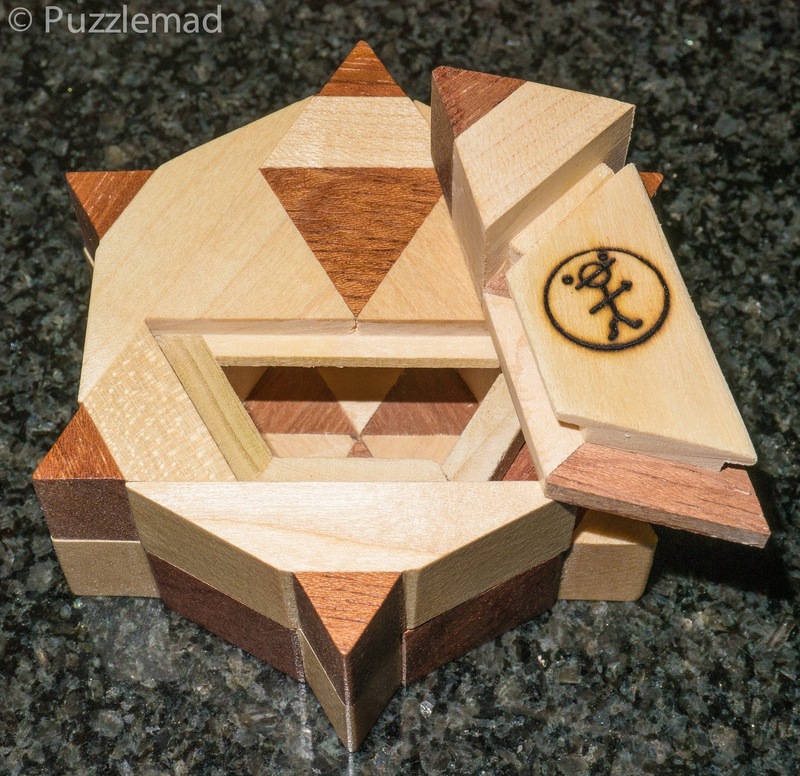 The Hexagram box is limited to 40 copies (including some in a "lumpy" finish) and is back to the Stickman roots requiring only a few steps to reveal the inner compartment. 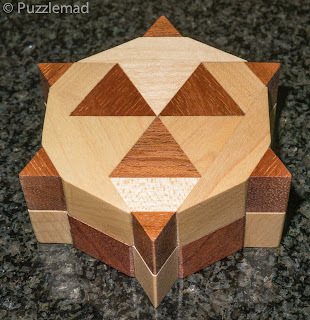 It is somewhat smaller than the recent boxes but absolutely stunning with 2 colours of wood and a with each face being an inverse of the other. I am not very good with boxes - I cannot say that I never buy them but I am very selective which I buy (this is more to try and preserve my finances than for any other reason). 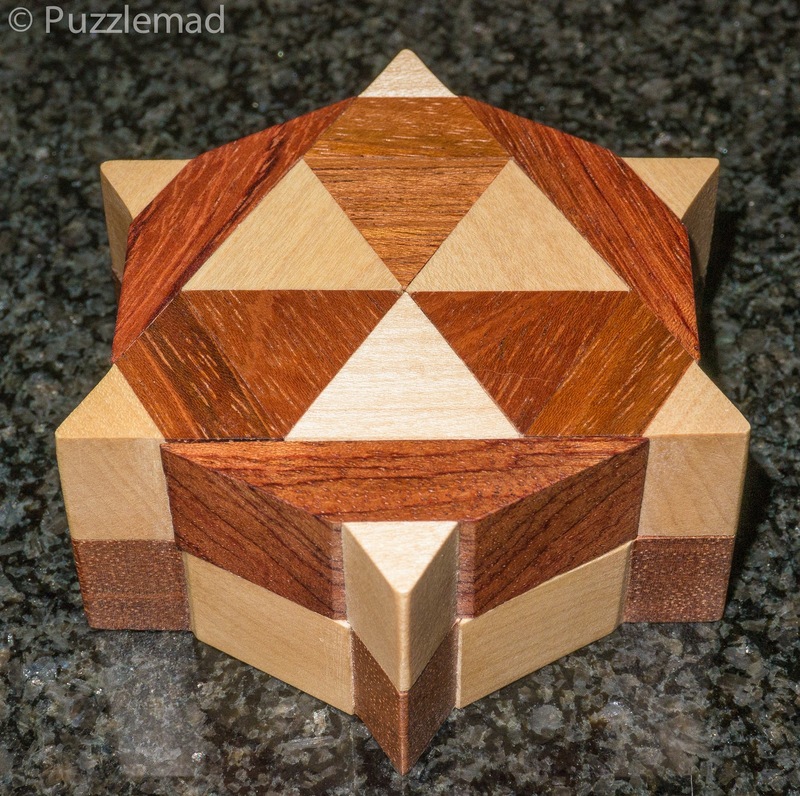 There are just 4 moves to find the compartment and despite this, I think I took about an hour to open it. It is a rather nice sequence and at least 2 of those moves were very unexpected to me. Very clever - I love the branded motif. I am aware that a few well-known collectors missed out on this and I am truly sad about that. I hope they find a way to add it to their collections. Economic theory powerfully argues that the only fair way to attribute those rare goods would be auctions. Your picture of the solved box reveals a lot about the solution. A spoiler alert would have been welcomed.